The KTM X-Bow R has been completely revised and even if the new developments of the KTM X-Bow R are not obvious at first glance from its outward appearance, a lot of things have been changed around the carbon monocoque. The engineers did not restrict themselves to improvements to the engine. In fact there have been improvements in all other relevant components to ensure that an optimal performance can be achieved. And that is because the customers had clearly expressed their wishes that the super sports car that many of them want to take to the racing circuit weekend after weekend, should be even more extreme, even faster and even more powerful. And what the customer wants is what KTM delivers. In 2011 the product range of the super sports car with the carbon monocoque includes the KTM X-Bow R, the most powerful version yet developed. The "R" is the result of concentrated further development of this spectacular lightweight sports car. In the rear of the "R" is a 300 hp 2.0 Liter TFSI engine from Audi with a maximum torque of 400 Nm and this ensures an unbelievable driving experience both on and off the racing circuit, because naturally the KTM X-Bow R is homologated for use on the road. At the German premium carmaker Audi, KTM chose one of the most efficient and powerful engines with a 2.0 litre displacement. This is all about an engine block that was used by the Ingolstadt-based company for a long time in the S3 model and which generated up to 265 hp. there. It was later also used in the TT-S with 272 hp. For use in the KTM X-Bow R, the reinforced block has a bigger turbo, an altered fuel injection system and the engine electronics have been additionally updated by Bosch Engineering Group (BEG). This means that the performance not only increases to 300 hp but also the torque: to be exact 400 Nm are set free at 3,300 revs and results in a very smooth torque curve which provides impressive drive in all situations. This was how the KTM X-Bow evolved into the 'R' but it was far from complete. For the engineers, the additional power meant that the entire periphery - from the engine mounting to the suspension had to be reviewed. And that is why, in addition to the engine, very many other parts of the vehicle were either changed or completely newly constructed. 60 hp more - a good 25 percent - caused far more extreme forces that meet and must be absorbed on the engine mounting points on the aluminium rear frame. It was the aim of the development not simply to meet the additional burden but to strengthen the rear beyond that of the 240 hp model. The solution was to reposition the torque support arm. Up to date this had been attached to the rear frame, now it sits directly on the carbon monocoque. With this, the torsional stiffness is significantly increased, especially when accelerating out of corners and the KTM X-Bow R handles even better on the road as its "little brothers" the X-Bow Street and Clubsport. By relocating the torque arm and its connection, the developers then faced another demand. The entire engine unit should be lowered to lower also the center of gravity. The initial target could be even exceeded thanks to clever construction so that the drive unit now sits lower in the rear frame by a massive 19 mm. The main effect: the vehicle's already impressively low center of gravity has been moved even further down towards the road surface so that the central center of gravity of the vehicle is lower by 15 mm. 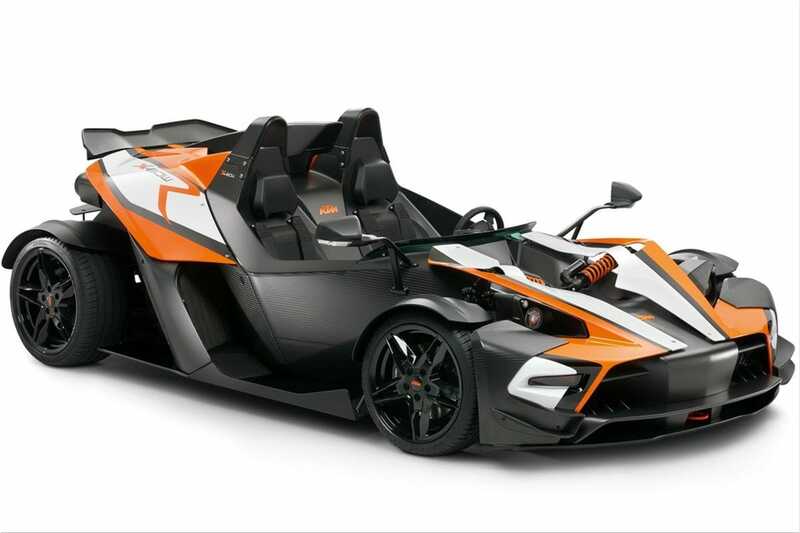 As a direct consequence even higher cornering speeds and greater lateral acceleration of more than 1.5 g is possible and the handling of the KTM X-Bow R is significantly improved. 25 percent more power, higher cornering speeds, greater G-loads. All this has resulted in a significant additional burden on the chassis, which in combination with the tires represents the final link in a long chain for achieving optimal contact with the road. The push rod suspension on the front axle, which comes directly from the Formula racing sport, but also the suspension on the rear axle has been revised. The first step was trying to reduce the friction on the wishbones of the X-Bow. For this purpose special Teflon washers have been used to reduce the friction and play, which at the same time improving the precision and the response of the suspension In addition to this the engineers devoted time to the springs and shock absorbers: stiffer springs in the front and rear suspension and new damping characteristics meant that the KTM X-Bow R is characterized by an additional increase in the handling, even more extremely exact and delicate than up to this stage of the development. The price of the KTM X-Bow R is € 58,795 (excluding national taxes and import duties).